I was driving through Queen Victoria Park on Sunday when I saw a hive of activity at the foot of Murray Hill (6075 Niagara Parkway). 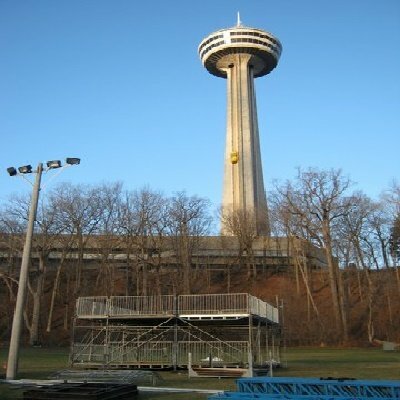 Workers were setting up staging for Canada’s largest free New Year’s Eve extravaganza. That family show takes place on Wednesday evening Dec. 31st staring at 9 pm. The line-up includes, Australian Country singer Keith Urban, Nick Jonas, one of the Jonas brothers of the pop-rock band, Lights, a Canadian electropop musician and singer song writer Shawn Mendez. There will be fireworks at 9 pm for the younger folks and another spectacular display over the falls at midnight for the folks who can stay awake. This is Canada’s only nationwide televised (by Global TV) event. Check this site for plenty winter packages.